Hulk for GCN! Smashy smashy was never so fun! So it’s the weekend. This is the time of the week where people can party hard, go out and do stuff, not have to worry about work, that kind of thing. Me, I rent video games. Last weekend was a bit of a bust because both games I wanted were out at Rogers Video and Blockbuster. Oh, wait, Blockbuster didn’t have either of these new titlesat all, never mind available. Stupid Blockbuster. I guess what I’m trying to say is, fight the damn Americans and rent your movies and video games from Rogers instead. Unless you live in the States, then do whatever the Hell you want. So back to the story, both games were rented out already and there was nothing else that I really wanted. But what were these magical games that could grab my interest so exclusively? The first was Burnout 2: Point of Impact. I’d assume that it’s a great game because the first was really good. Oh, it’s a racing game of you cared to know. And I’m not big on racing games, so you can bet it’s really good. The second was even more appealing, but since it wasn’t so much of a sequel as Burnout 2 was, I must admit that I was a little skeptical. 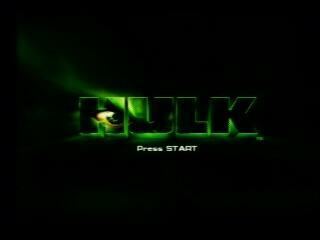 That second game was Hulk. I’m not sure why I was at all skeptical about it. Spider-Man was great. X2: Wolverine’s Revenge was even better. So that makes a 100% success rate for next-gen video games based on Marvel movies. Why should Hulk be any different? Well, to be completely honest, I’m always skeptical about a new game that doesn’t come from Nintendo or Capcom. 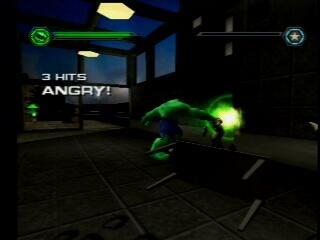 And it just so happens that Universal Interactive made Hulk, and they don’t exactly have the best track record. But today I went back there and took that game for all it was worth. And let me tell you, it was worth all 6 of my dollars. If I had to sum this whole review up into one word, it would be “incredible”(pun intended). Hulkis a very fun game to play, or at least I think so. Basically, it’s just another 3-D brawler, but seeing as I love that type of game, it fits me perfectly! On the flip side, there are a few stealth-oriented levels peppered throughout the game, but they’re not all bad, and definitely not something that would take away from the overall goodness of the game. But, I’ll get to that a little bit later. 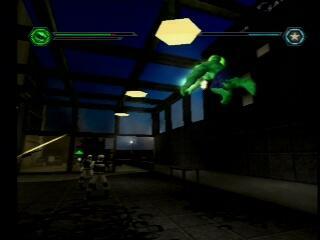 Now as I said, the game is first and foremost a 3-D brawler. If you don’t quite get that, think Double Dragon or River City Ransom in 3-D. If you’re still a bit perplexed, it’s a game where you walk around and beat up enemies. I guess if I had to compare it to any other game, it would be Minority Report. They’re the same kind of game at heart, they both have lots of fighting, they both have lots of stuff to break, and they both have a lot of the same options and special features. But, Hulk has no guns or jetpacks, and Minority Report has no Hulk. I’d say they’re about even on my rating scale, if Hulkisn’t just a bit higher. I guess the first thing that I should cover is the main game. Or, Story Mode, if you will. What this consists of are many different levels with cutscenes in the middle. And that would be one of my first gripes. The cutscenes seem to be too many in number. 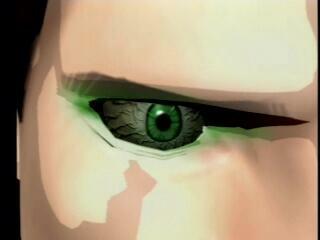 It’s not really the FMVs that get to me, but the actual in-game cutscenes. In some levels there are none, but in some, there’s one every few steps. Luckily, not too many levels are like that, and it doesn’t hamper the gameplay too much. And, as for the length of the game, I’m not quite sure because I haven’t beaten it yet. But if the last two Marvel games are anything to go by, there should be more than 25. That said, the levels themselves are actually nice and long. To be more specific, they canbe nice and long. Most enemies in the game will regenerate infinitely and you can just sit there all day pounding on the same guys over and over. 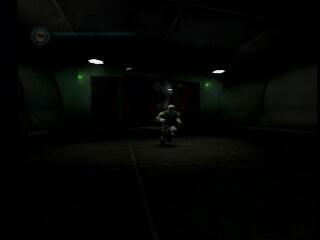 But if you prefer to run from these sorts of areas, you could beat the levels a lot quicker. Not to say that they’re short if you don’t intend to waste time. They can still be pretty good length, but as in most games, they all vary. Some are long, some are short, but it all comes together in the end. 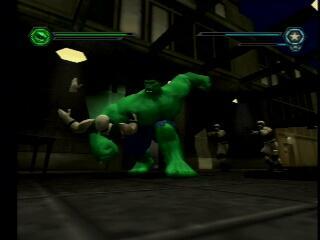 As stated earlier, you’ll be playing as the Hulk for about 70% of the game. It’s good old smashing and bashing everything in sight. You can do a lot of things to rid yourself of enemies. The basic idea would be to punch them into submission, but you can also jump attack, clap, stomp, throw, bludgeon, and squish them to death if you wish. Much like in Wolverine’s Revenge, Hulk has a rage meter, and when that gets full, Hulk gets stronger, his attacks have longer range, and he might get a bit faster. It’s hard to tell, really. The only really noticeable thing about it is that you can do this super huge sonic wave attack that takes out anything in front of you. But of course, you can also use the surroundings to your advantage. 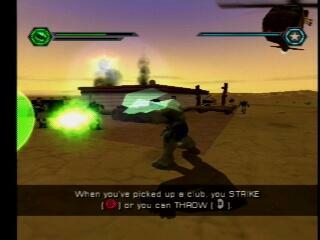 Hulk can pick up virtually anything around him from pipes to smashed helicopters and beat enemies with them. Or if you prefer, you can just throw them. The only time the fighting can really get overwhelming is the boss stages. 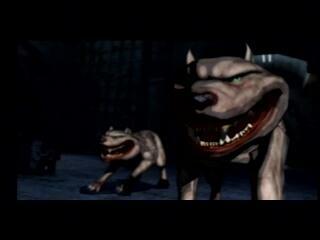 The first boss, Half-Life the vampire, is relatively simple to beat, but the catch is, you can’t touch him or he’ll drain your energy. The second boss fight is against a red Hulk-like guy named Madman, where you have to destroy computer consoles while avoiding him and his cronies. 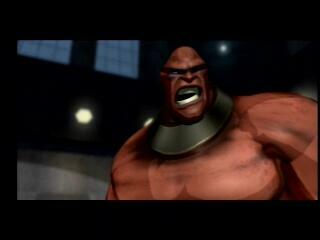 Then once that’s done you have to fight him in his rage mode. And if that wasn’t hard enough, there’s the constant threat of the respawning bazooka guys. And that’s only what I’ve seen so far. For the other 30% of the game, you’re playing as Bruce Banner, scientist on the lam. His levels are a lot less action oriented, having him rely mostly on stealth to survive. 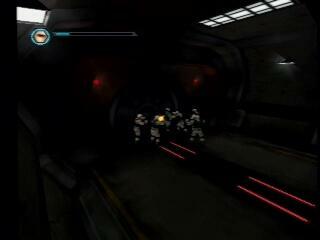 Yup, just when you’re having fun pounding soldiers’ heads into the floor, the game goes all Metal Gear Solid on you. Of course, I really shouldn’t compare this to MGS, because if I did, Hulkwould rank about as highly as that fungus growing behind most department store toilets. But that’s just the Banner levels. The rest of the game still rocks the house. The only part that really amazed me about these levels is that the guys who made it have a different excuse for every single level as to why Banner can’t go Hulk. But as you can probably tell, I don’t want to write anything else about the stupid Banner levels. So, what do you do when you’ve beaten the game? Well, first off I’d suggest beating it on the two difficulty levels that you didn’t the first time through. After that, it’s just playing for fun. Of course, there are plenty of extras in Hulk. Extras make me happy. Most notably is the Challenge Mode. It’s more or less just fighting arenas where you can see how many bad guys you can kill. There are five different Challenge games, the first two are endurance matches, the second two are timed matches, and the last one, entitled “Hulk Smash”, I haven’t played yet so I can’t tell you what it is. The first one is unlocked at the beginning of the game, but the other four open up as you progress through the Story Mode. Next up we have the “Hulk Unleashed” section, which is comprised of a bunch of movies and such. There are two trailers for the Hulk movies, the first being the infamous “teaser trailer”, and the second being the more recent “trailer trailer”. There’s also one of those “Making of” videos, but it’s the making of the game, not the movie as you might expect. 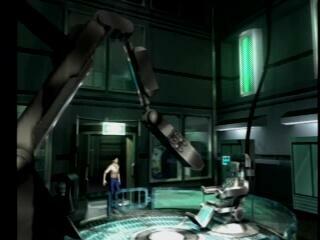 As you progress through the game, you can also view any FMV scenes that you’ve seen here. Finally, there’s a “Hulk Movie F/X” movie, but it’s locked so I can’t tell you exactly what it is. Popular speculation leads me to beleive that it has something to do with the movie’s special effects. In addition to that, they’ve added some movie production art to sweeten the deal and make the fanboys salivate. Finally, we have the cheat menu. Strangely enough, you have to unlock all the cheats with codes. Well, maybe that’s not that strange but you have to unlock almost all the production art and one of the movies with said codes as well. Then there’s the complication. There are two different ways to enter codes. And each code works uniquely to one of these ways, never both. 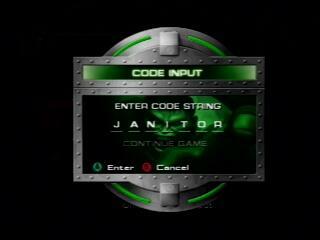 The first way to enter codes is to simply go to the “enter code” menu and type it in. The second way is to find a cheat console somewhere in the game and type it in there. Ant it pretty much goes without saying that these cheat consoles are only in Banner’s levels, and they’re pretty out of the way. I’m not even sure if you can find out the codes in the course of the game or if you have to look them up in a magazine or on the internet. 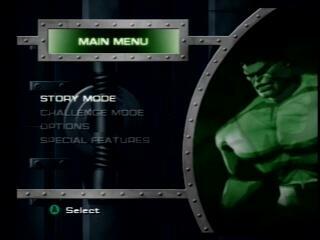 And, a cool little rumour that’s going around says that a super-secret code will be given in the Hulk movie that opens some kind of new gameplay mode. If it’s true, I think that’s pretty cool. So, now that I’ve covered every possible aspect of gameplay, what about the rest? I’ll start with graphics. Just to give early warning, this game is cel-shaded. But not in the traditional sense. Only the characters really look it, and it’s more of a comic type shading than a cartoonish style. All in all it looks pretty good, especially on the non-human characters. The environments are pretty well done, but some of the textures just don’t look right. Not that they’re all pixely like in Super Mario Sunshine, but there seems to be a lack of detail. Other than that small problem, the game looks very nice, and even the most spoiled of graphics babies should enjoy the way Hulklooks. I, being the audiophile I am, place a lot of weight on the music/sound of a game. 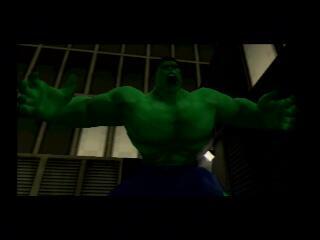 The Hulk only disappoints in the aspect that the background music is rather faint and can get annoying. It’s not anything catchy that you’ll be humming. I suggest turning the music volume all the way off (but keep the sound volume on) and put on the radio or a CD. Something like Rammstein or Disturbed would suit Hulkvery well. As for the sound effects, they’re all good. The clanging, smashing, all that stuff, it’s all there and it sounds just fine. 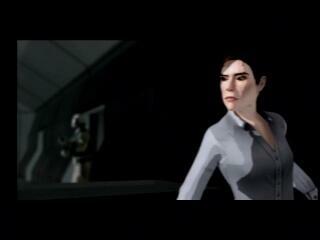 As for voices, the voice acting is done rather well, almost as good as in Batman: Dark Tomorrow. The fact that enemies are very vocal makes for a hilarious experience. “Oh crap!! I need backup!” and “Hey! Put him down!” are just a couple samles of the rather humourous things enemies will say as you pound your way though enemies. Even banner talks to himself while you play his levels. My only gripe is that Hulk never talks. No “Hulk smash!” or “Hulk angry!“. Just grunt and roar, grunt and roar. Oh well. All in all, I think this category did pretty well. And now we come to control. As was Wolverine, Hulk controls a bit sloppy, but it really doesn’t matter since you’ll be mashing the A button most of the time. One significant problem is aiming. It’s tough to get Hulk to face exactly where you want him to, and using the lock-on function is mostly useless, because enemies are almost always in groups of 4-8, so you probably won’t lock-on to the guy you wanna hit. Like I said, just pounding the A button will do fine in most cases. Another problem is launching the rage attacks. One of them is B+Y, and as those familiar with the GCN controller will know, pushing those buttons at the same time is quite the task. Luckily, you can also press Y+X to do (I think) the same attack. Another problem is the first-person look. Control is way too sensitive and it’s basically useless. Final gripe here is that you have no control over the camera whatsoever, which changes angles with the wind. So, I’d say the controls are mediocre at best. Finally, we come to replayability. Essentaily, it’s a rather reply value-less game, but you can go through it at least 3 times, one for each difficulty level. After that, it’s just Challenge Mode and playing around with all the different cheats, some of which can actually be quite entertaining. Of course, if you’re really hyped up about the movie, you an watch the trailers over and over again, as I did with my Ocarina of Time/Master Quest disc while waiting for The Wind Waker. For a final score, I give Hulk an 8. The lack of good music and sloppy controls lost one point each. But, I can tell you enough that this is an extremely fun game while it lasts. You might just want to rent it once or twice because it’s not gonna last much longer after you finally get bored with it. Or, if it eventually goes down to $20 like Spider-Man did, then you should definitely think about buying it. I know I’m gonna enjoy this game all the way until it has to go back. Yeah. Rent good idea, buy only if bargain bin. 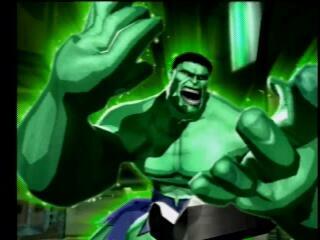 Hulk angry if you not play Hulk’s game. Hulk want smash more little people. Hulk really need voice in game. Yup. That’s how I feel about Hulk. If you wanna take my word for it, go ahead, but if you’re some kind of stupid person that doesn’t like beat ’em up games, you can go play some other game. But Hulkis great. I strongly urge anyone and everyone to go and at least try it out. Very, very fun game. Needs two-player smackdown mode though. Maybe that’s what the mysterious “movie cheat” will be. Who knows? It is just a rumour after all. So this brings an end to article number 11 I think, not including Chat Radio, but including the Gallery and Guides. I think so anyway. Yeah. Well, the Easter thing was the 10th, but I did include Chat Radio in that figure. But the numbers don’t really matter, it’s the quality of my many, many offerings, right? I guess it doesn’t matter either way because I don’t really have many readers yet. But 3 is a good start. So that’s all for today, see you in the MegaMan 4 article!